Finish up your bathroom remodel project with this chic, chrome-finished tub shower faucet from JALO. Your tub or shower will look even more stylish with this fixture. 59" flexible hand shower hose. Bathtub spout flow rate : 6.1 gpm (60 psi). Handshower max. flow rate : 2.5 gpm (80 psi). The GROHE Tallinn Single-Handle Tub/Shower delivers both modern style and relaxation in 1 urban-chic set. Featuring clean lines, geometric forms and a minimalist attitude, it consists of a tub spout, showerhead, and control valve. The large showerhead is equipped with GROHE DreamSpray technology, which optimizes water distribution for a satisfying shower experience with even, consistent coverage, and GROHE SpeedClean spray nozzles, which resist lime scale buildup. All are finished in GROHE StarLight Chrome, a dirt and scratch-resistant finish that requires little maintenance and will look good as new even after decades of use. The Loure handshower holder perfectly complements any contemporary bathroom design and works well with the Shift Square handshower to add functionality to the bathing space. With wall mount installation, this holder brings your handshower conveniently close, allowing you to target water to specific areas of your body. Majestic Wall-Mount Tub Shower Faucet in Chrome Finish up your bathroom remodel project with this chic, chrome-finished tub shower faucet from JALO. Your tub or shower will look even more stylish with this fixture. 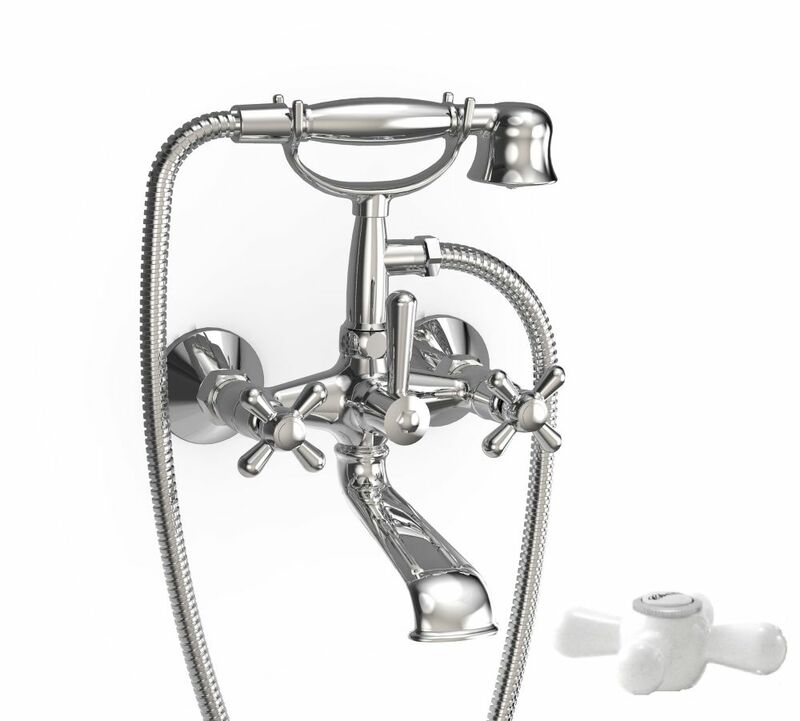 Majestic Wall-Mount Tub Shower Faucet in Chrome is rated 3.7 out of 5 by 3. Rated 5 out of 5 by Mouse from Well made! I bought this for my new place and I absolutely love it. Rated 2 out of 5 by Helpful from Hand shower I bought this product online a month ago, and I was very pleased with how fast it arrived, Within a few days I was able to install it in my new bathroom. It looks nice, however, the pressure of water is so weak in shower handle, so much so that I can't even have shower. Rated 4 out of 5 by Donato from Heavy and nice Chrome Finish Delivery was much faster than I expected to Mississauga, Ontario. No one could tell me how to install it (including company) . The fixture has no 'body' that gets fastened to anything? To install this fixture as a wall mount I used two elephant ear elbows which solider on to copper pipes. . (Typically used for shower head pipe installation). These brass fittings are about $7 each . Kindly confirm that the Jalo Majestic is designed for a &quot;wall mount&quot; vs &quot;deck mount&quot;. Thank you.. Does this fit a clawfoot tub? Can anyone please recommend what type of valve rough-in is comparable with this faucet. Thank you! Is this a 4&quot; spread faucet to faucet? If not do you have one that is that mounts onto a claw foot tub?